The head and body length of the Parma Wallaby ranges from 17 to 21 inches, tail length from 16 to 21 inches, and weight from 7 to 13 pounds. Males are larger than females, and have a more robust chest and arms. The Parma Wallaby is normally solitary under natural conditions, although feeding aggregations of 2, and rarely 3 are sometimes observed. Primarily nocturnal, they take cover among the shrubs during the day and emerge at dusk, or shortly before, to feed on grasses and herbs. When hopping, they remain close to the ground in an almost horizontal position with the forearms tucked tightly against the body. At a medium pace the tail is curved upward in a shallow U-shape. It was thought to have become extinct during the nineteenth century, when foresters were doing their best to eliminate it because of damage to pine plantations. Some were exported to zoos and research institutions to establish breeding colonies from which the species might be returned to the wet forests of New South Wales. However, surveys demonstrated that it still occurred in New South Wales. The range of the Parma Wallaby is East New South Wales, and Australia. 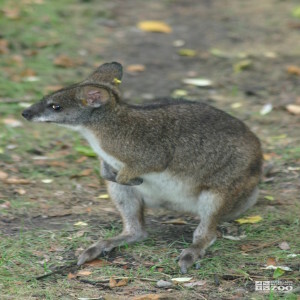 Parma Wallaby's inhabit wet forests with a thick shrubby understory associated with grassy patches. The Parma Wallaby is normally solitary under natural conditions, although feeding aggregations of 2, and rarely 3 are sometimes observed. Primarily nocturnal, they take cover among the shrubs during the day and emerge at dusk, or shortly before, to feed on grasses and herbs. When hopping, they remain close to the ground in an almost horizontal position with the forearms tucked tightly against the body. At a medium pace the tail is curved upward in a shallow U-shape. It was thought to have become extinct during the nineteenth century, when foresters were doing their best to eliminate it because of damage to pine plantations. A stay of execution was granted while some were exported to zoos and research institutions to establish breeding colonies from which the species might be returned to the wet forests of New South Wales. This enthusiasm was found to be misdirected, however, as surveys demonstrated that it still occurred in New South Wales. Most births of Parma Wallabies occur between February and June. Females become sexually mature at one year of age. Males reach sexual maturity at 20 to 24 months. The single young is born after a gestation period of about 35 days. The first excursion from the pouch is made at about 23 to 25 weeks, and the young leaves the pouch at about 30 weeks. Weaning is not completed for another 10 to 14 weeks, during which time the female may give birth to a second young.